Sharing maps and location dashboards are becoming a more significant part of the Spotzi Mapbuilder. Many of our customers are looking for the possibility to create ready-made dashboards that they can share with their clients or colleagues. 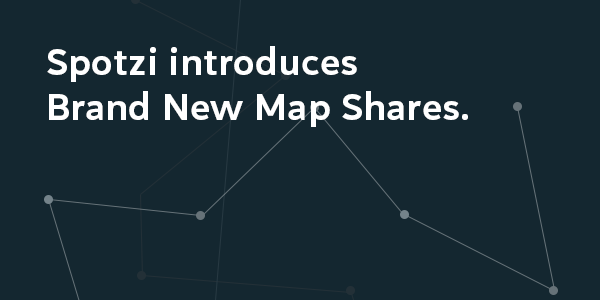 Driven by this demand we have completely redesigned our Map Shares. This resulted in a brand new share functionality that exceeded all our expectations! 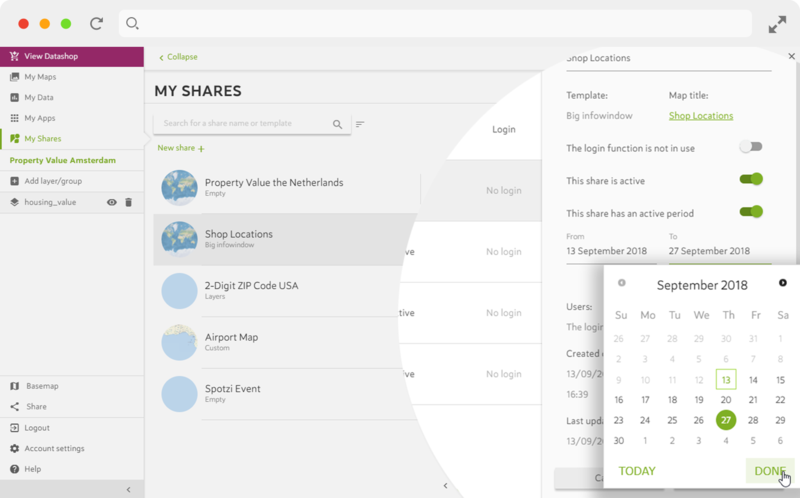 You now have a dedicated page where all your shares are collected. On this page you can edit the settings of your shares. Add a login to your share. This makes it possible to only allow a certain group of users to access your share. 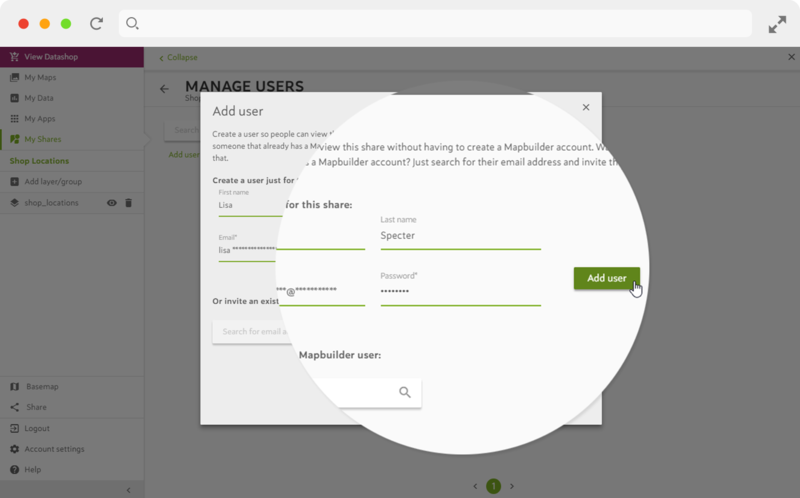 You can invite users that already own a Mapbuilder account. Do you want to invite users that don’t have a Mapbuilder account? No problem. You can create a guest user with an e-mail address and a self-defined password. From now on you can activate/deactivate your shares. It is also possible to activate your shares for a certain period. With an advanced user management you have the ability to add users, delete users and to change the password of your guest users. All from one interface. 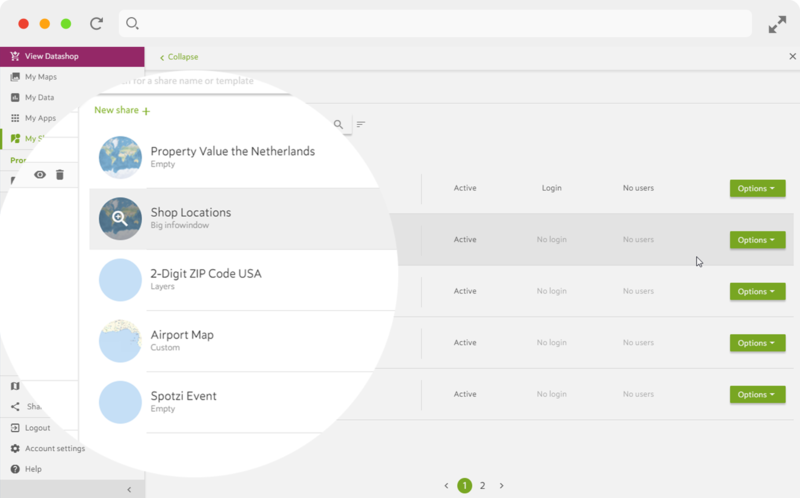 With our Map Shares we have added a bunch of new functionalities to share your maps with colleagues and clients. Did you know that you can also add graphs and charts to your maps and turn them into insightful location dashboards? The Spotzi Graph App makes it possible. A great way to make your shares even more impressive. To give you the best possible user experience we are continuously improving our Mapbuilder. With every release new functionalities are added. To keep you informed of every change we launched the release notes page. On this page you can see an overview of all bug fixes and functions that are added after every release.